Donna (Meryl Streep) sings about her financial problems. The feel-good cinema event of this summer! Bollywood movies are just crap compared to Hollywood’s muscial movies! In 1975 Swedish band ABBA released the world hit song Mamma Mia! Such a good song that it was first adapated in a theater musical. Now it’s also adapted to the cinema in a movie starring Meryl Streep and Pierce Brosnan. Musical films were plenty in the past but the interest faded with time. But the success of musical movies from India, even in the Western world, may have prompted Hollywood to renew with a tradition from the past. The muscial movie Mamma Mia is starring Meryl Streep and Pierce Brosnan (who is not anymore James Bond…). ABBA, who made the original Mamma Mia!, song was a Swedish band. But this movie is not sweded like in Be Kind Rewind! 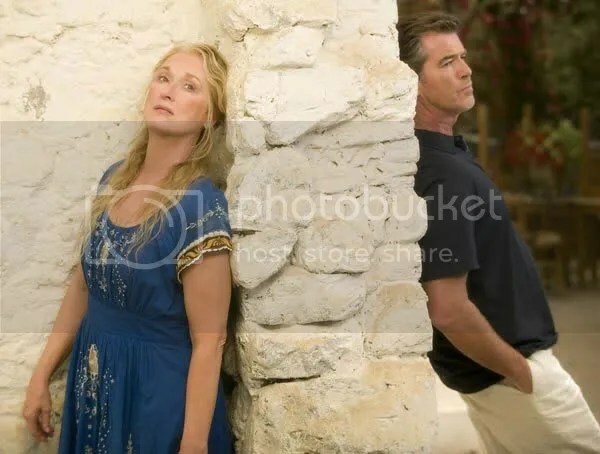 Meryl Streep and Pierce Brosnan are starring in Mamma Mia! an upcoming movie adapation of the musical based on the famous hit of the same name by ABBA.